Palestinian president condemns closure of al-Aqsa mosque as a "declaration of war" while clashes rage in east Jerusalem. Israel temporarily shutdown the flashpoint religious shrine on Thursday in what police called a temporary measure aimed at calming tempers following Wednesday's shooting of Yehuda Glick, which they called an attempted assassination. Palestinian president Mahmoud Abbas has condemned the Israeli closure of the al-Aqsa mosque compound as a "declaration of war", while clashes raged in east Jerusalem after Israeli police shot dead a Palestinian man suspected of shooting and wounding a far-right rabbi. The rabbi survived the attack, and the hospital where he was being treated said he was in a serious but stable condition. Glick is a member of the Temple Mount Faithful, a group which calls for "liberating the Temple Mount from Arab [Islamic] occupation". The group advocates rebuilding a Jewish temple at the religiously-important site, including the area containing the mosque. The mosque will be open for Friday prayers but police will only allow access to Muslim men over the age of 50, with no restrictions for women. The earlier closure prompted Palestinian President Mahmoud Abbas to declare the move as tantamount to a "declaration of war". Israeli police on Thursday shot dead Mutaz Hijazi, a Palestinian whom the police claimed was responsible for firing at the US-born rabbi, who is known for his lobbying to secure Jewish prayer rights at the al-Aqsa mosque compound. Sources told Al Jazeera that Hijazi, 32, was killed in the al-Thori neighbourhood of East Jerusalem during an attempted arrest. Police spokesman Micky Rosenfeld said Hijazi was "armed… and opened fire on the police". Timeline: A review of the critical events that have marked the history of al-Aqsa mosque in Jerusalem. He had spent more than 11 years in an Israeli prison - mostly in solitary confinement - before his release in 2012, according to the Palestinian Prisoners Society. Residents of the Abu Tor neighbourhood, where Hijazi lived, dismissed the official version of his killing, saying he was unarmed during the raid, which happened around 5:30am. Several neighbours said police fired on them when they attempted to leave their houses to see what was happening. Bloodstains and bullet holes were visible on the roof of Hijazi’s house several hours later. "The police came into the neighbourhood, dozens of them, and he ran to the roof of the building," Mohammed Shwayt, who lives down the street from Hijazi’s home, told Al Jazeera. "They started shooting almost immediately." The killing prompted daylong clashes in Abu Tor, located south of the Old City, with dozens of local youths coming out to throw stones at police. The district was blanketed with tear gas for hours, and at one point a stray canister ignited a delivery van. Palestinian Red Crescent workers at the scene said there were no injuries. By afternoon it was unclear whether Hijazi’s family would be able to bury him before sunset, according to Muslim tradition. Last week, a resident of neighbouring Silwan district drove his car into a crowd of passengers disembarking from the city’s light rail, killing two and injuring seven others. He was also shot dead by police. "This is how they deal with Palestinians," said Samir Natsheh, a neighbour of Hijazi. "They don’t arrest us." Glick's shooting took place outside a conference promoting Jewish access to the holy site, a hilltop compound in Jerusalem's old city. Israeli politician Moshe Feiglin said a man approached Glick outside the conference and spoke to him in "heavy Arabic-accented Hebrew". He then opened fire at point-blank range and fled. 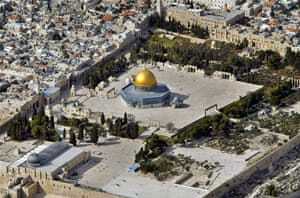 The Al-Aqsa mosque compound houses Islam's third holiest site, but is also revered by Christians and as the most sacred spot for Jews who refer to the site as the Temple Mount. Although non-Muslims are allowed to visit the site, Jews are not allowed to pray there. The normally bustling entrances were eerily quiet on Thursday. Police stopped a group of right-wing Jewish activists from entering the compound, and four of them were arrested. Amid several clashes in recent months, Abbas has recently called for Jews to be banned from the site, urging Palestinians to guard the compound from visiting Jews. Muslim worshippers have also faced tight restrictions since the summer, with men under age 50 routinely barred from entering, particularly during the month of Ramadan. Jerusalem has been seething for months, since the July murder of Mohammed Abu Khdeir, a teenager from Shuafat who was burned alive in a revenge attack for the killing of three Jewish Israelis in the occupied West Bank. His killers were arrested several days later.